2013 was going to be a challenging year for me with the volume and distance of the events I was planning on undertaking. 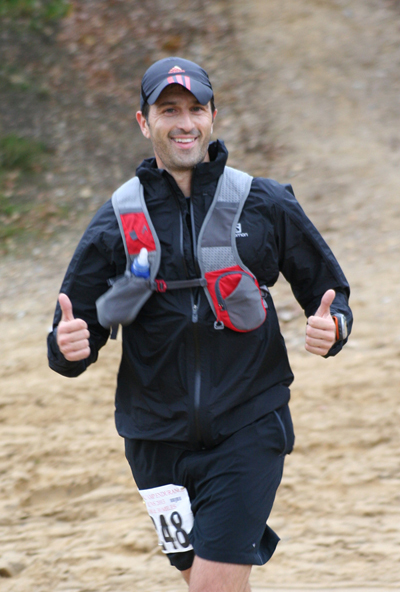 The main focus of the entire year was going to be my first crack at the Spartathlon with the GUCR acting as a planned stepping up point this year (i.e. I needed to substantially improve my finishing time here). All other races were pretty incidental to be honest, I wanted to complete them but times and results were of no real importance.. unfortunately one of them happened to be the Thames Ring the longest non-stop race in the UK at 248 miles and not one to be ignored! Oh well, here goes..
January was a miserable month. It was dark, cold and the weather wasn’t great and I had a touch of the New Years Blue’s running wise. I didn’t have any events planned at all and only clocked around 200 miles running that month. A pretty average start to a huge running year. I kicked off February with my annual run at GoBeyonds Thames Trot event which I’ve completed every year since its inception and is a local run to me. The event involves a 48-mile run from Oxford to Henley following the Thames River. Due to flooding of the Thames River late in 2012, the route had to be diverted and was reduced in length by a few miles this year. I had a pretty good run on a cool and crisp day and covered 45 miles finishing in 6hrs 49mins which included a couple of bonus miles when I ended up going the wrong way towards the end of the race although the route diversion had made a simple navigational run a touch more challenging this year and several other people had gone off track at a couple of points. No big deal really as the route had been shortened in the first place. The first ultra of the year had been completed and a 6.49 45 miler compared pretty well to a 8.08 48 miler the previous year so I thought that wasn’t a bad start to the year. The only downside was a bit of a groin niggle which was aggravated by slipping around in the mud. The week after I ran the Wokingham Half Marathon and clocked a new PB of 1.30.53 which was great but not quite the elusive sub 1.30. However, despite a couple of improving results my mind still wasn’t completely Sparta focused and I felt I wasn’t really putting the effort in so I made a last minute decision to enter Challenge Running’s St Peters Way Ultra organised by my good friend Lindley Chambers. I completed the inaugural running of this 42 mile event in 7hrs 54mins but this had been a planned training run when I started near the back and after a brief comfort break in the first mile was actually in last place but eventually plodded my way to around halfway. Lindley was kind enough to put me up the night before the race and a bit of banter led to a light hearted mileage challenge being set between us which was the little incentive I needed to put in some more effort. Overall, I clocked 258 miles, completed 2 Ultra’s and set a new PB at the Half Marathon distance. Not too shabby overall I guess. The month of March saw a bit of taper period as I was tackling the second running of Centurion Running Thames Path 100 later in the month. I took part in the Reading Half Marathon which was my local Half Marathon. It’s a good, well-supported event with a great finish in the Madjeski Stadium although it is a little expensive compared to other runs. Still, I have a 7 or 8-year streak going here (even managing to run it in 2007 break my ankle a few weeks later and then recover “just” about in time for the 2008 running of the event). I have started to alternate between an effort year and a fancy dress year for fun. This time it was the “effort” year and there was some additional fun as I was leading “Team Covea”. My employers had kindly agreed to subsidise some race entries and organise some technical running T-shirts and I was captaining and coaching some of the 30 runners taking part. The event saw some horrible weather with heavy rain during the day which meant crowd support was down on the usual numbers and people got, soaked and cold and it ended up being a really miserable day. However, the guys looked great in their red technical t-shirts and really stood out, we also had a 100% completion rate (no DNF’s in my team please) and I managed to clock a new PB of 1.29.46… yes just under the 1.30 but it took the mother of all sprint finishes at the end of the race to get there. 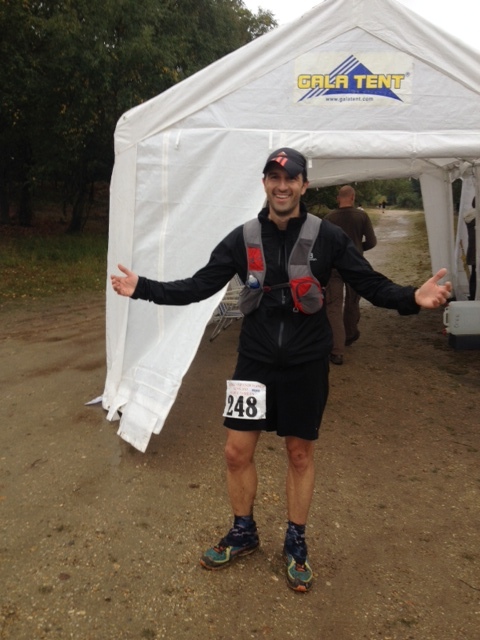 A week later I had my first big race, the Thames Path 100. Unfortunately some of the Thames Path was still not runnable due to earlier (months ago) flooding and the route was diverted and came to about 104 miles in total this year. I ran quite a bit of this with Michael Sartorious and we set out far too quickly arriving at Checkpoint 1 in the top ten and then had to back off a bit. I ran the first half solidly and then met Lindley Chambers who had agreed to pace me for the second half of the race for the evening and night leg. I did my usual thing of just power walking the night leg and should have made more of an effort to be honest. The weather was also pretty poor, it was freezing cold and wet and I think I recall it was snowing slightly. I finished in 22hrs 26mins which was an improvement on my previous 100-mile PB of 23 ½ hrs so an hour’s improvement but should have done more in the second half of the race. The groin injury was still a bit of an annoyance but nothing to stop me running. The end of March saw my first 300 mile month ever, a Half Marathon PB again and a 100 mile PB. I had also started doing easy hill reps at least once a week. So why wasn’t I really feel like I was making an effort? 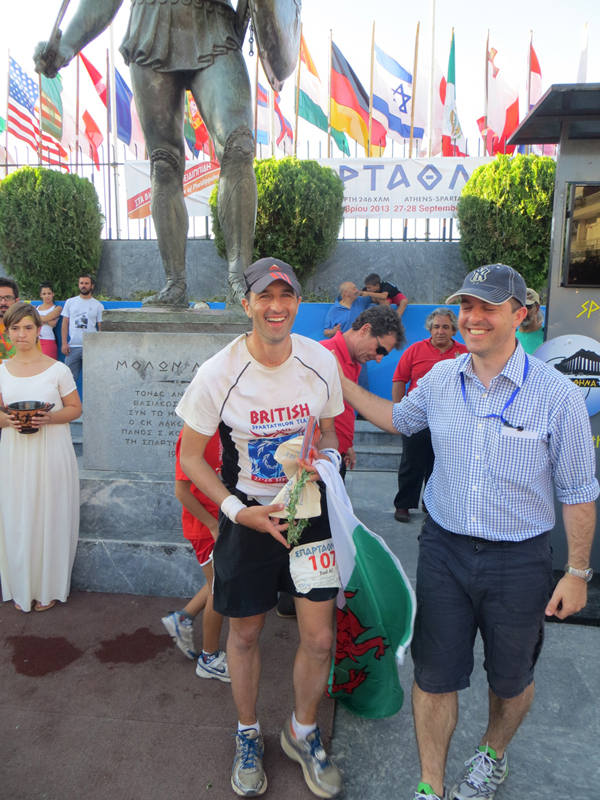 I think the challenge of the Spartathlon was on my mind quite a bit as this was the only race I was thinking about in serious detail, I had been reading every blog I could find, chatting to people I knew who had tackled it to try and learn every scrap of detail in advance. I guess deep down, I knew I needed to be in peak condition to succeed and I wasn’t there yet. 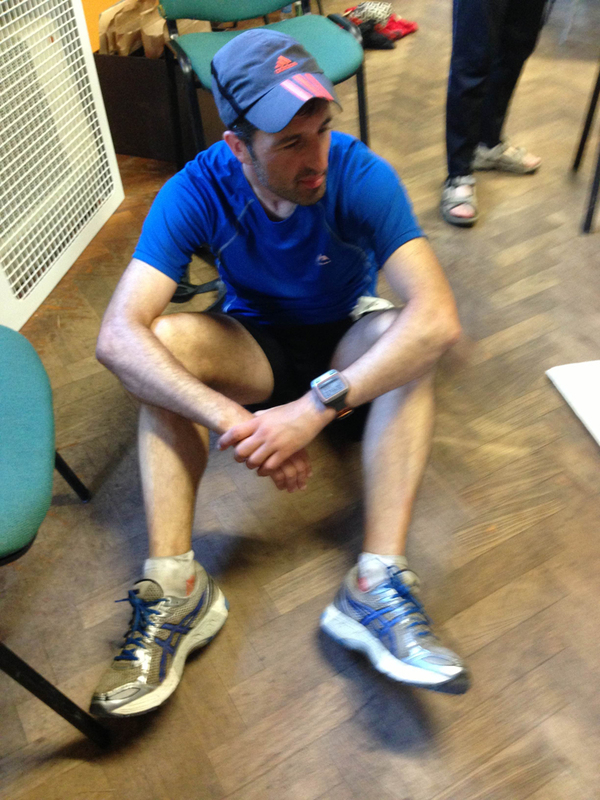 April saw me complete the Compton 40 a two weeks after the Thames Path 100. I finished the 40 mile event in 6.57 about 1 minute quicker than last year and a new 40 mile PB but I definitely flagged in the last couple of miles as I recall Guy Mawson trotting past me quite comfortably at the end! The rest of the month saw me follow my usual training pattern of lots of short runs during the week and a couple of medium length runs on the weekend. My previous mileage banter with Lindley had helped me clock up 70 miles per week in April to clock a new monthly high of 301 miles (by 1 mile) and a 40 mile PB (by 1 minute). Yeah ok, not much of a victory then. However, I was probably more excited about being 200 miles ahead of Lindley in the mileage game (sorry mate). Ah May, one of my favourite months. My Birthday and the GUCR all in the same month, how lucky am I! 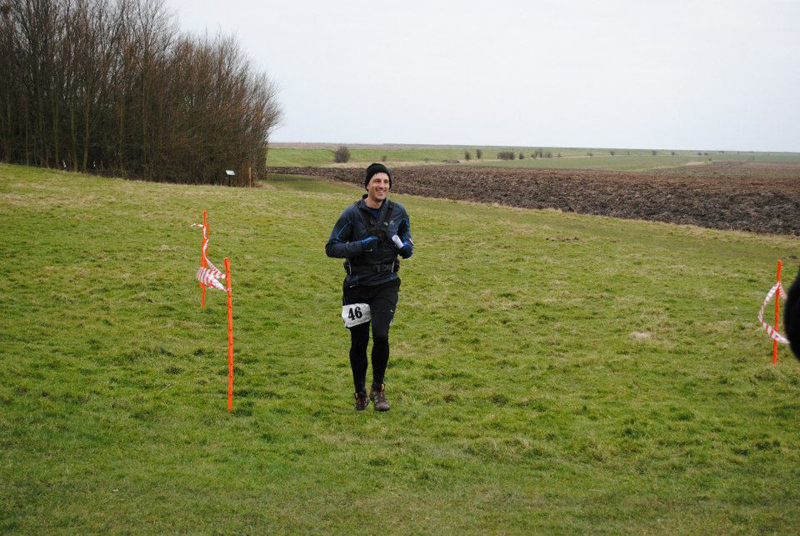 A solid couple of weeks running before taking part in the Ridgeway 40 which is predominantly a walker’s event but a handful of runners usually take part. The staggered start times and dominance of walkers meant at one point I was in the strange position of leading (although it wasn’t technically a race) before Ian Berry eventually caught me up and finished ahead of me despite a half hour head start. I finished in 6hrs 23mins which was a new 40 mile PB and over half an hour quicker than Compton a few weeks earlier. I also met Andy Humphrey here for the first time, Andy kindly offered his assistance with putting together Ultra Tales and does some of the behind the scenes work on the e-zine. 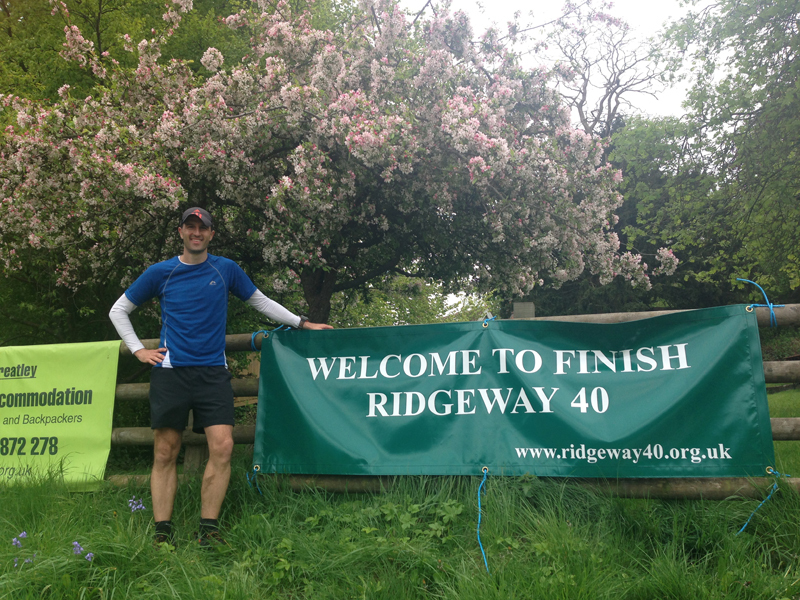 I had two weeks between the Ridgeway 40 and my first big goal the GUCR so it was a period of lower mileage (it wasn’t a complete taper to be honest). I finally saw a sports physio about the persistent groin injury who after putting my body through various contortions commented that it didn’t look like a muscular injury and suggested it could be hernia related and may be worth seeing a GP.. not what you want to hear a week before a 145 mile race. As it hadn’t impacted my running, I decided not to worry about it and carry in running. Yes it was a minor annoyance but there was too much I had committed to in 2013 to pull out of races. I could always have it checked out if it got any worse. I ran my first Parkrun in ages and managed a sub-20 5k which was a nice little confidence boost before the GUCR. Funnily enough knowing I wanted to do a real effort run meant I was actually feeling nervous before this run.. 145 miles no problem but nervous over a Parkrun. After 2 supported (i.e. with crew) completions in the GUCR with unremarkable finish times the plan for the GUCR was to aim for a 32-34 hour finish which would put me within the Spartathlon cut-offs. I wasn’t going to worry about cut-offs along the way either it was just about the end goal. The Friday night banter is great, meeting and mixing with the other runners. I met Rob Pinnington for the first time here. 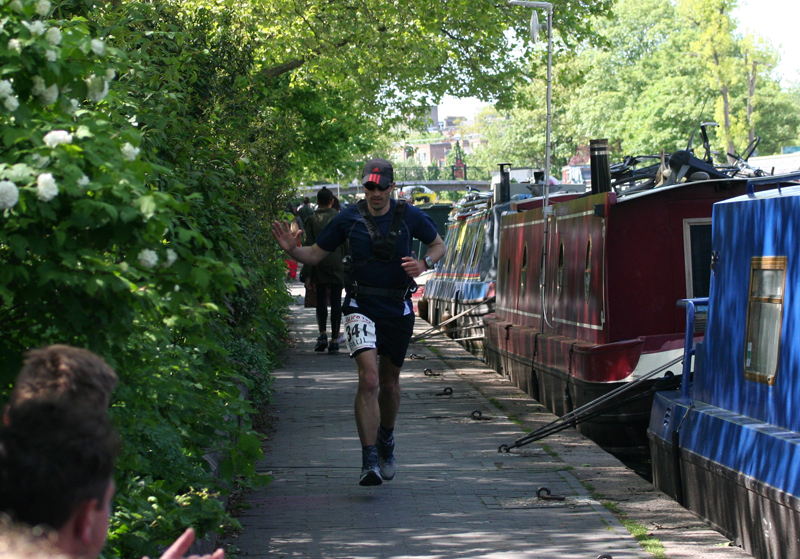 This was also the first time I was tackling the GUCR without Stouty but he had travelled up and was marshalling at various points during the weekend having gone all triathlon this year. I set off quite near the back and took it pretty comfortably early on. 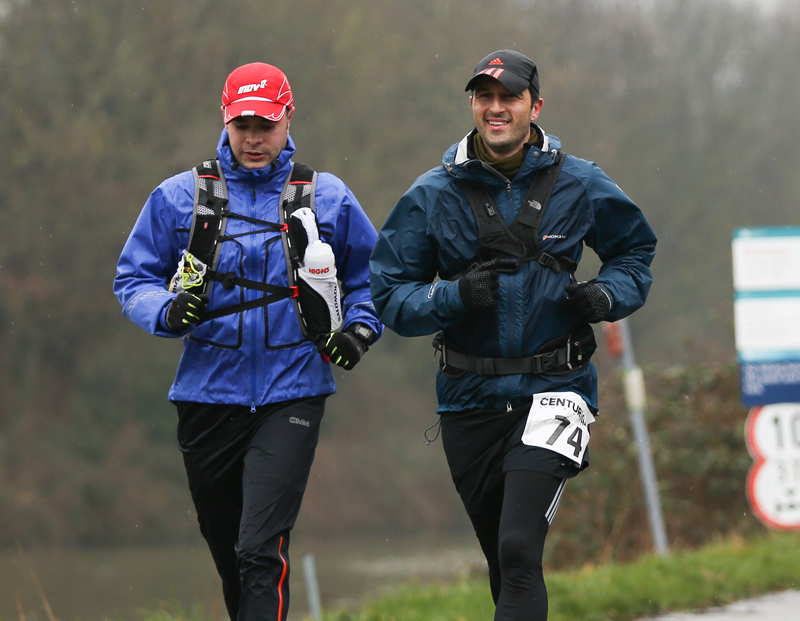 I was working my way up the field and met Matt Dunn, my pacer in the evening about 70 odd miles in at Navigation Bridge. Matt was going to cover the next 50 miles with me. Unfortunately, I did my usual effort of flirting with a run and settling into a fast march during the night. I struggled a bit with lack of sleep (having had a rubbish nights sleep the night before) and had my little meltdown moment (pictured below) before getting into the 120 mile checkpoint looking at a 34-35 hour finish at current pace and in 11th position. This was a 4-5 hour improvement but it wasn’t good enough and this was THE build up race to Sparta and so unlike my normal approach of gradually slowing to a crawl at the end of a long race before a little dash for the last 20 yards (for the benefit of any camera’s.. hey look at me I’m still running after 99.9 miles… just ignore the last 50 miles I walked) I started to run, chase those ahead and run. I managed to overhaul a 2.5hr gap on 4th place at the time to finish in 32.45mins. I was really happy with the finish and particularly with the fact that I could dig deep if I needed to. I finally had a GUCR finish I could be satisfied with. May, saw 326 miles completed and 2 PB’s in the 40 mile and 145 mile distance. Things aren’t looking too bad here. I had a whole 5 days rest without running before getting back into it but June was a light month as I only had 5 weeks before the Thames Ring at the start of July. 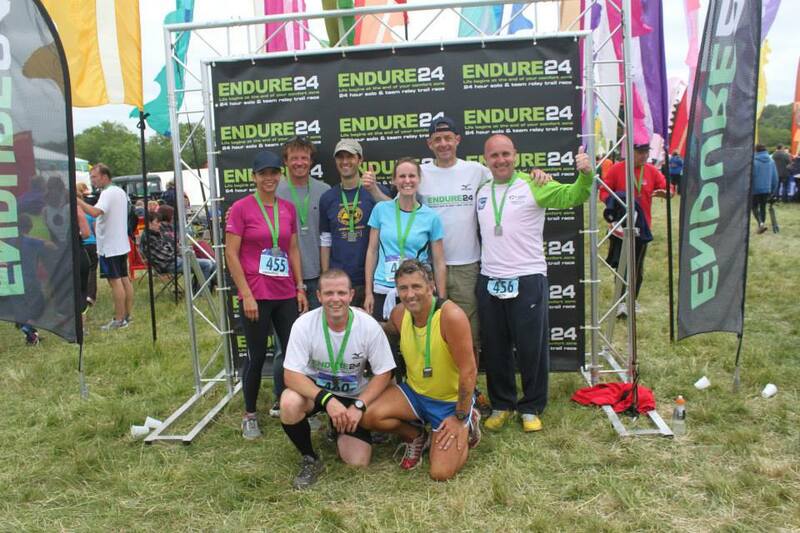 I took part in my local event the Endure 24, a 24 hour time based event in Aldermaston (literally 10 inures drive from my house) with competitors running as many 5 mile loops of the track as they can within a 24 hour period. There are entry options for solo’s (which I did in 2012), pairs, small teams up to 5 and large teams up to 8. 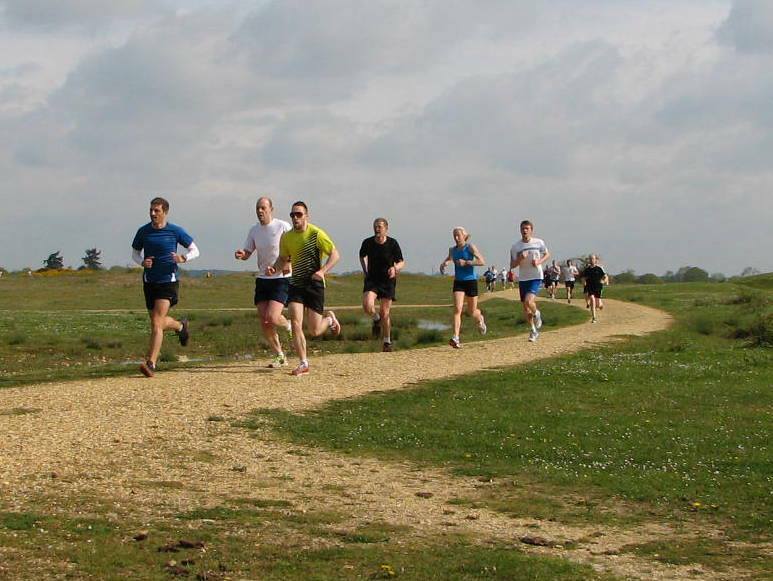 Having first run this in 2012 and enjoying it, I joined Stouty in a Newbury Runners mixed team of 8 and ran 5 x 5 mile laps to help the team came 2nd overall in their category. It was a great weekend and good to see the event grow in size from its first year. I ran 222 miles in total for the month and took part in just the one event for the month. The Thames Ring is a 250 mile non-stop run (you can sleep as long as you are ahead of the cut-offs but the clock is always ticking) around the South East of England. It’s pretty much home territory for me as the route runs past my workplace and having helped marshal at the 200 mile checkpoint in 2011 (it’s run every 2 years) and seeing the state of the runners I just had to have a taste of some real long distance action. As a planner and organiser I had found it difficult to come up with an approach to this race. To be honest, as it wasn’t an “A” goal race, I hadn’t focused on it too heavily and I also found planning where to stop and rest difficult as I really wasn’t sure how I would cope night after night with limited sleep.. By my own admission I struggle on the night phase of a run in one night, how on earth was I going to survive up to 4 nights of sleep deprivation? Well, that was sort of the challenge really. I ran with Michael Sartorious for the first 80 miles (we had planned to run together if possible for the whole route) but injury claimed him after the first night and then I ran most of the remaining part of the race by myself. 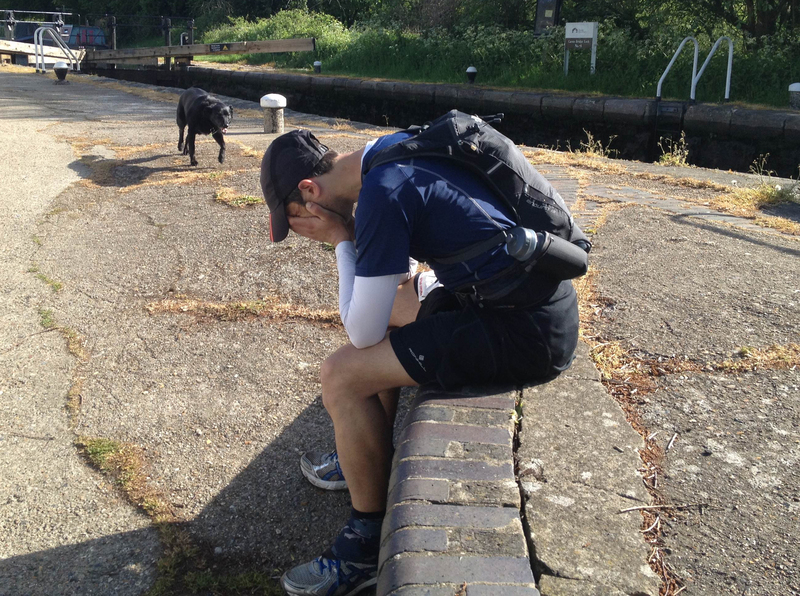 I knew I hadn’t recovered from the GUCR which caused a bit of a mental spiral downwards with negative thoughts and I was seriously considering quitting the race before the 100 mile mark. It’s easy to say you were close to quitting and then act like some type of hero when you overcome those negative emotions but this was genuinely the closest I have ever come to just giving up. There were numerous phone calls to family and friends at that time to keep me going! A quick thanks to Lindley Chambers, James Elson, Dave Bayley, Sue Albiston and a handful of others at the 100 mile checkpoint. A few friendly and encouraging faces at the 100 mile point helped push me in the right direction. I slogged out a 60 hour march largely by myself to finish the event in 7th place in 82-83 hours overall. Sleep wise, I had survived on 1hr on the first night, 1hr on the second night and 2hrs on the 3rd night. I had tried to sleep for 5 hours at a time (and in a bush at one point somewhere past Milton Keynes) but the adrenaline and emotion of being in a race just kept me awake and alert. I was remarkably coherent and alert at the end of the race and it felt pretty good to complete that beast. Interestingly, I moved a lot slower than I expected overall but slept a lot less and finished around the time I thought I would. A quick word of thanks to everyone who helped out at the Thames Ring as a lot of people and hours coverage is required at checkpoints so everyone’s time is much appreciated here. In fact, it was a bit of a lift bumping into and chatting with people I knew at each checkpoint. I was completely wiped out after the Thames Ring. My sleeping pattern was all over the place for a week and one day off work to recover (although I only do a desk job) wasn’t enough to be honest. I also couldn’t be bothered to run, I was physically exhausted and just couldn’t sum up any enthusiasm to get my trainers on and get outside. I had a planned couple of weeks off and then as I headed towards the end of July started to get nervous that I wasn’t going to be prepared for Sparta. I was only 8 weeks away from my big goal and felt shattered and exhausted. I only did one other race which was a 10k at the end of the month finishing in 45.04 which was a few minutes off my PB but good to get the legs moving again. July had seen 391 miles covered (why didn’t I try and make it 400?) and the Thames Ring completed but I was wrecked towards the end of the month. This was going to be a critical month in the training plan. I was fortunate that my wife and daughter were going on holiday for a couple of weeks (I had just had my holiday plodding around the Thames Ring… actually it was Sparta but finances meant some sacrifices had to be made) and I had some more time to bank the miles. 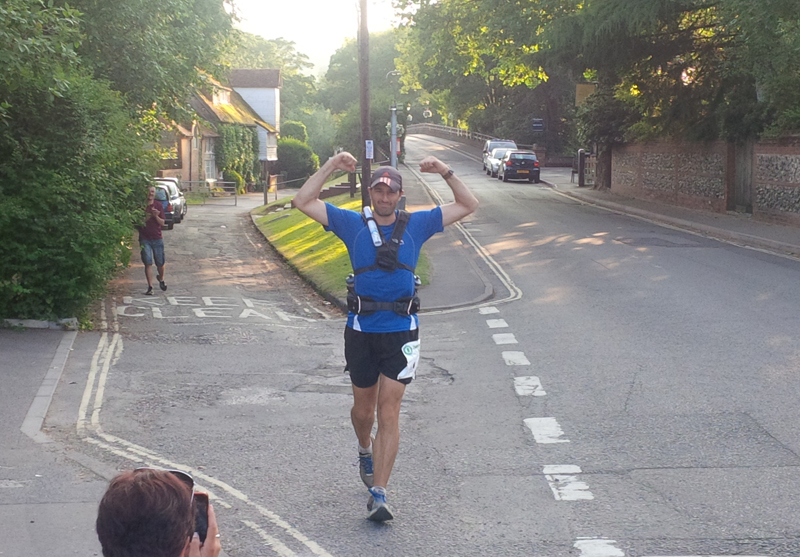 I also had the Thames Meander Marathon and Ayot run in consecutive weeks at the end of the month. I knuckled down and ran, not fast but banked loads and loads of miles. I averaged about 90 miles per week finished the Thames Meander marathon in 3.33 and feeling comfortable and ran 50km at the Ayot run in 4.13 which was a PB for the distance (well I had only run the distance once before at the Salisbury 54321 a couple of years ago). I also enjoyed the weekend I crewed at the NDW 100 manning the aid station at Detley (82 mile point) and returning the favour for Matt Dunn by giving him a lift home after the event. 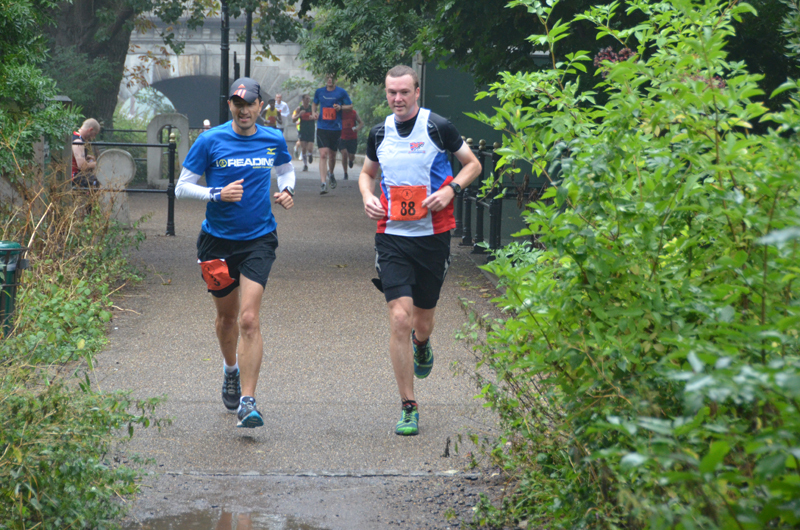 August saw 406 miles banked with a couple of well paced long distance races at the end. I had also been keeping up with the regular weekly easy hill reps and I was getting down to my lowest weight for a while. I was feeling a lot better at the end of August than at the start of the month! I had planned a 3 week taper before the Spartathlon and started to reduce the mileage down to 75 miles, 50 miles and then 20 miles the week before. 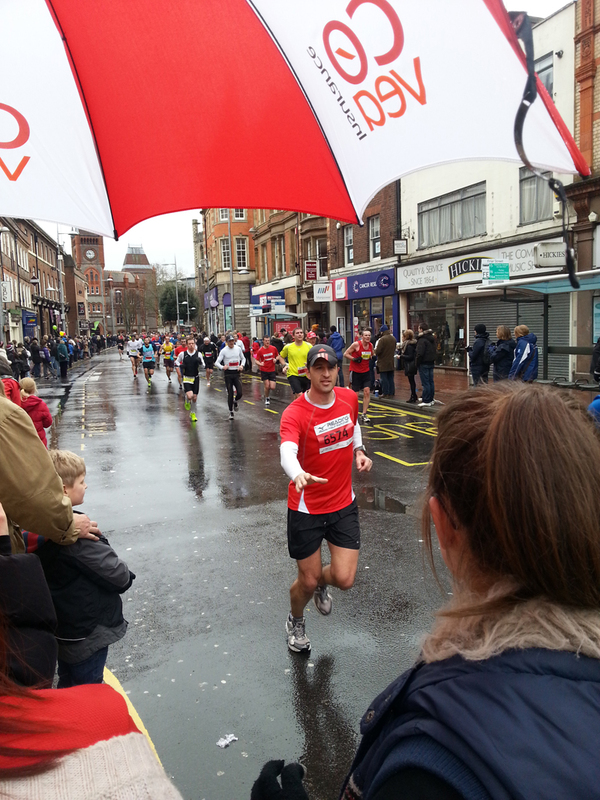 I did run the Farnham Marathon 2 weeks before Sparta but took it steady finishing in 3.55. By that time my weight was down to my lightest for 20 years and I was ready for my big challenge. There’s always more you can do but I was satisfied that I was in good shape. I did complete the Swallowfield 10k and took 2 mins off my previous PB to finish in just over 41 mins which was a nice little confidence boost. 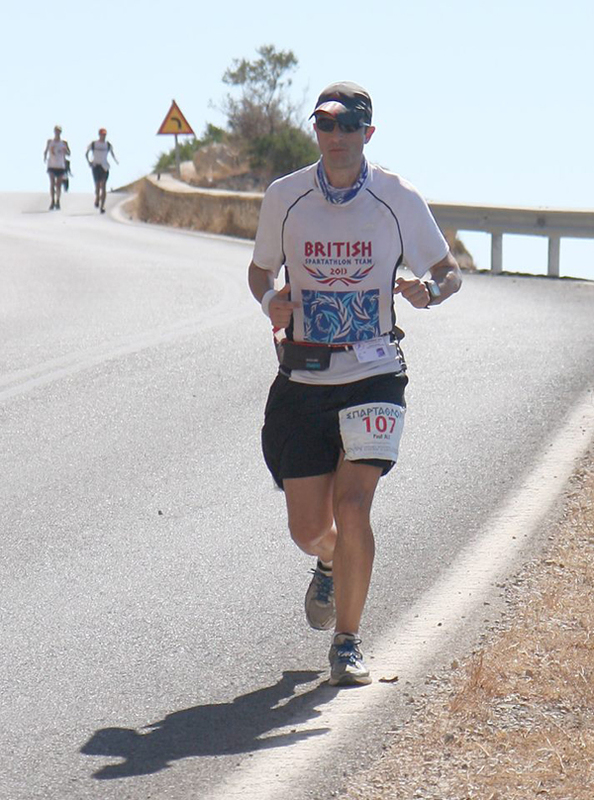 Spartathlon was an amazing experience and I thoroughly enjoyed participating in the British Spartathlon Team and meeting up and hanging around with a pretty cool and easy going bunch of people. During the race itself I ran the first 50 hard and built up a 1.15 buffer over the cut offs. The second 50 saw a run/march effort although I started to suffer with sore quads due to the constant pounding on the road and the undulating nature of the route but I still got to the 100 mile point in 20hrs (over 2 hrs quicker than my Thames Path effort earlier in the year). I made a bit of a meal of the mountain which to be honest wasn’t nearly as bad as expected with the switchback nature of the path meaning it wasn’t that steep but the relatively straightforward descent killed my quads leaving me in real discomfort. I physically found it painful to run with pain shooting up my quads and fast marched the last 50 odd miles using up my buffer on the way to finish 103rd in 35hrs 7mins but a finish! Despite finishing in the worst physical state I have ever been in (quads shot, feet bloody and blistered) it didn’t feel like the hardest race I have ever completed. Despite my body gradually deteriorating during the race I was absolutely mentally switched on and was determined to grind out a finish in any way possible. Tough race yes, but definitely achievable. The honest advice I had heard at the start was few people of my level (i.e. an average just about sub 24hr 100 mile runner) will not finish it on the first go. Hopefully, I have proven that it can be achieved and inspire a few others to give it a go as James Adams (British Spartathlon Team Captain) inspired me. I do feel as if I could have achieved a better result as I marched far too many miles and I would definitely recommend lots of road-running as part of your build up to the event but I would have absolutely taken any sort of finish at the start of the year so won’t overly complain. I have to add a few words about the iconic end of the race where you stagger the last few hundred yards down the street in Sparti towards the end of the race to the adulation of the crowds lining the street. Children run behind you, the crowd are eagerly clapping you, waving their flags and banners and shouting “Bravo!”. Fellow runners from all nationalities are out supporting you acknowledging your journey from Athens and then those final moments as you reach your goal and touch your parched lips on the foot of the Statue of Leonidas and turn to the crowed to receive their applause… it was a glorious feeling. I think the satisfaction came because it was a real challenge to get there and this was THE moment I had pictured in my mind for many many months from the time I entered the race. This was the result of months of effort in training and planning and even then the result is not certain (unless you’re Pat Robbins who had a brilliant run and a top 10 finish). It did feel slightly uncomfortable to see other British runners not achieve their goals. However, the guys were all really supportive with the view “You’ve earned it, enjoy the moment, don’t worry about everyone else, the race will always be there”. It felt pretty good to be part of a great British team. How would I have felt if I had not ben successful? I honestly could not comprehend a situation when that was going to occur, I really don’t know how I would react. I’m really not looking forward to my first DNF and facing the world of Ultra running social media as I’m not sure I would be honest enough to admit my own failings. I might just have to blame borderline hypothermia… (to continue the joke). With my brother Peter at Sparta. It was great to see my brother Peter who had travelled out to watch a bit of the race (the first Ultra he had seen) and thanks to Sue, Lindley and Gemma, Mimi, Tim and Becky (and everyone else) for their support and lifts! I was wiped out after the race (people had commented I was pale and looking drained) and could only shuffle around as my quads were really sore. There was no further running that month which resulted in a total of 315 miles run, a marathon completion and a Spartathlon finish, I’ll take that any month. 3 months of the year to go and my goals had already been achieved, so what do I do? Well run another Ultra and so 3 weeks after Sparta I lined up at the last ever Caesars Camp Endurance run do run the 50 mile event. I grumbled my way around this for the first half but settled into it in the second half to finish in around 10hrs. 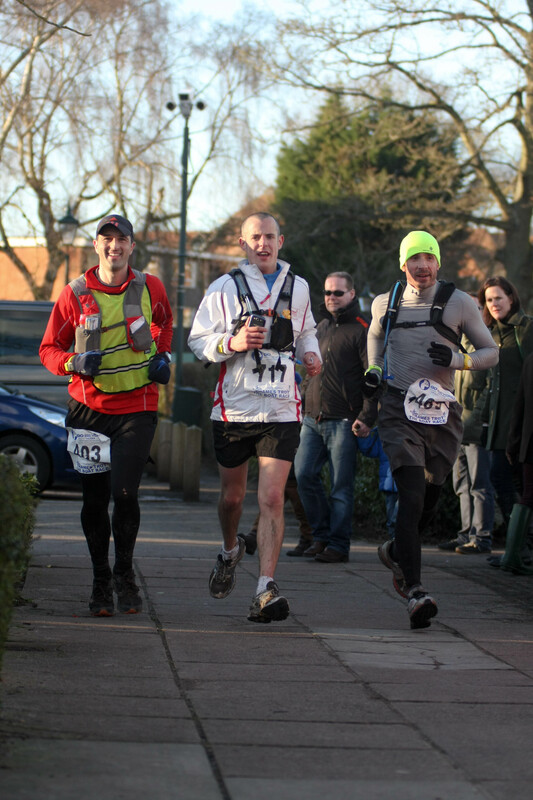 A week later I took part in the Stort 30, gave a bit more of an effort and finished in 4.11. I wasn’t really running much during the week as I was still recovering from September’s exertions and only clocked 166 miles during the month. There’s been little to speak off in November. The mileage has reduced and then stopped when I picked up a knee injury and rested for a couple of weeks. I returned to light jogging and swept the Winter 100 course but to be honest the knee is still not 100% right and I only amassed 153 miles but did go through the 3,000 mile mark for the year. Woo hoo! My last race is the Portsmouth Marathon at the end of the month. I had planned (weather dependent a bit) to have a go at my Marathon PB and aim for a Good For Age time of 3.15 but the knee injury has meant I’ve been reduced to short light runs and so it’s just going to be a boys day out with a run and a pub lunch and no pressure on a time. I should really have rested more and taken the month off but I committed to the Marcothon (a run streak event in December) and after failing miserably last year with an early drop due to injury but I am determined to see it through this time. The slightly better news is that the groin seems to be settling down with my brief periods of rest. The build up to Xmas has not been good either and I’m currently over half a stone heavier than I was in September with 2 weeks off work and Xmas dinners and treats to deal with! And that’s my summary of the year. Despite ending the year as a slightly overweight, injured, over the hill runner I have had a brilliant year despite my limited talents. Although I didn’t feel it at the time, looking at the improvements in times and running hours logged during the year I have put in a good level of effort and determination this year and am pretty satisfied with my overall efforts. However, we should always strive to be better and there are lots of things I could improve upon (more speed work, more rest, better taper) and…. I’m probably going to ignore all of those things. Details to follow in my 2014 plans blog which I will write up next. Plus, as you can see from the photos above the “lucky” hat is a bit worn, a bit battered but is still going strong until Stouty buys me a new one. A final note to say that as many of you know, I put together a free running e-zine called Ultra Tales which reports on primarily the UK ultra running scene. This has resulted in a lot of time and effort over the course of the year in putting this together and I’m grateful to a handful of people who have started to provide some assistance. We introduced a new look this year and the e-zine has started to look like a semi-professional product. I am planning on continuing the publication of Ultra Tales as long as there is interest (and download numbers have risen from 1k per issue to 2.5 – 3k to the last couple of issues which is great) but could still do with lots of contributions and articles. I would love to have a report from every UK ultra and more original content, which hasn’t already been seen on people’s blogs. If you want to contribute here then please visit www.ultratales.com for further details. Great blog entry! 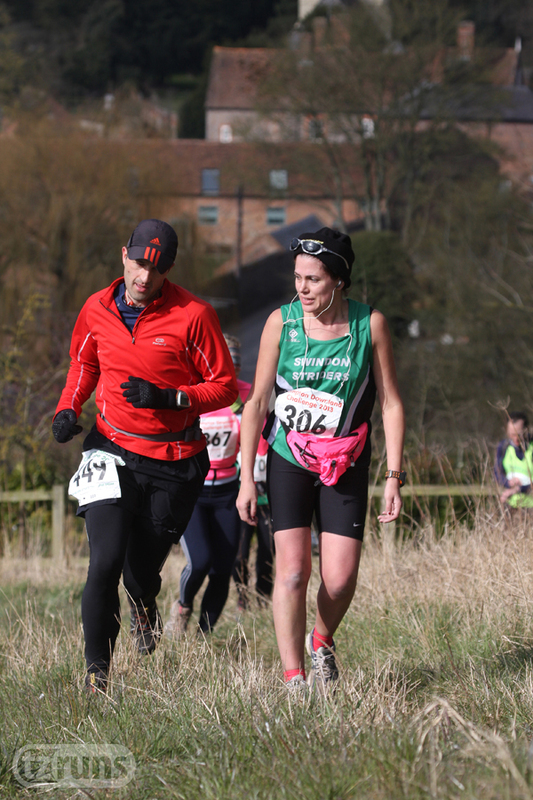 I’ve just started training for my first ultra (the Marlborough Downs Challenge)… In your world it’s a “baby ultra”, but for me it will be a huge challenge. Roll on 2014….